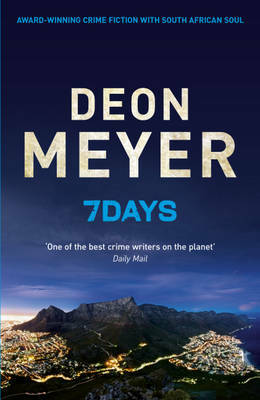 I always look forward to a new novel by Deon Meyer, and his latest, 7 DAYS, is a perfect example of why he is, in my opinion, one of the very best crime fiction authors in the world today. The novel is an exciting double mystery: a young lawyer, Hanneke Sloet, has been killed in her apartment a few months ago, but the police investigation has ground to a halt. Now, someone is emailing the police commissioner, stating that the authorities know who is responsible but are covering-up, so an officer will be shot each day until that person is convicted. Captain Benny Griessel, struggling to maintain an alcohol-free life, is called in to re-investigate the murder. Griessel is a great character, having appeared in several previous novels in this loose series. Now he’s divorced, struggling to make ends meet, trying to keep his relationship going with his two teenage children, and in love with Alexa, a singer whom we met in THIRTEEN HOURS - a complicated character with issues of her own to resolve. Respected by his colleagues, Griessel lacks self-confidence owning to the mess he considers he’s made of his life so far - and it is this mixture of professional competence and personal anxiety that makes him a character for whom the reader is rooting all the way. The book starts in classic police-procedural mode, as Griessel re-covers the tracks of the earlier investigation into Hanneke’s death. He is under extreme pressure because the emailer does carry out the threat to shoot a policeman, and goes public with the accusation that there is a cover-up. Griessel and his team put pressure on Hanneke’s colleagues at her law firm (getting quite tangled up in the complexities of the financial investment world in so doing), any friends she had, and track all her phone calls in a desperate attempt to solve the case before more policemen are shot. Captain Mbali Kaleni, the oddball female detective introduced in THIRTEEN HOURS, makes a welcome reappearance here as the officer in charge of solving the shooter case, with she and Griessel sharing any leads that they find. Deon Meyer is a rare author who is able to provide a ripping plot together with a large cast of fascinating characters, major and minor, as well as an ongoing social commentary on modern South Africa with its mixtures of languages, standards of living, cultures and attitudes. The translator, K L Seegers, does an excellent job of conveying all these levels in a freely flowing style. This thriller is very tense and exciting - I was struggling to guess the identities of the murderer and the shooter before the author reveals all in a very satisfactory conclusion - one part of which I got completely wrong and the other a little bit right. 7 DAYS is a marvellous crime novel which must be a strong contender for best crime novel of 2012.